Harley-Davidson Screamin’ Eagle / Vance & Hines rider Ed Krawiec scored his third consecutive Pro Stock Motorcycle drag racing final-round victory and sixth of the season at the Lucas Oil NHRA Nationals at Brainerd International Raceway. Krawiec, the defending NHRA Pro Stock Motorcycle champion, defeated Hector Arana Jr. in the final when the Lucas Oil Buell rider fouled at the start. The win is also the ninth in a row in 2012 for the Harley-Davidson® Screamin’ Eagle®/Vance & Hines team, which remains undefeated for the season. Krawiec qualified fourth at Brainerd with an Elapsed Time of 6.909 seconds. Harley-Davidson® Screamin’ Eagle®/Vance & Hines rider Andrew Hines qualified the team’s other V-Rod second at 6.887 seconds. Lucas Oil Buell rider Hector Arana Sr. led qualifying with an ET of 6.884 seconds. In Sunday eliminations, Krawiec advanced in round one when Pirana Z Racing Buell rider Shawn Gann fouled at the start. Krawiec then defeated Geico Suzuki rider Karen Stoffer and Sovereign/Star Racing Buell rider John Hall in rounds two and three to advance to the final. Krawiec got the 17th win of his career when Arana Jr. left the starting line 0.02 seconds early. Hines opened eliminations with wins over Küryakyn Buell rider Chip Ellis and Scott Pollacheck on a Sovereign/Star Racing Buell, but lost in the semi-final on a hole shot to Arana Jr., who won with a reaction time of 0.007 seconds and 6.914 ET to a 0.034/6.911 pass for Hines. The Harley-Davidson® Screamin’ Eagle®/Vance & Hines team will now prepare for the prestigious NHRA U.S Nationals at Indianapolis on Labor Day weekend. The team has won 11 Pro Stock Motorcycle events in a row dating back to 2011, but neither Hines or Krawiec has ever won at Indy. Krawiec now leads the NHRA Pro Stock Motorcycle division by 106 points, with 962 for the season. Hines is second with 856 points, followed by Arana Jr. with 760 and Arana Sr. with 630. Stoffer is fifth with 504 points. 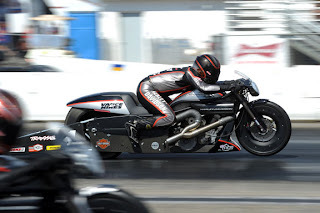 The Pro Stock Motorcycles will be back in action Aug. 29 – Sept. 3 at the 58th annual Mac Tools U.S. Nationals at Lucas Oil Raceway in Indianapolis, Ind.